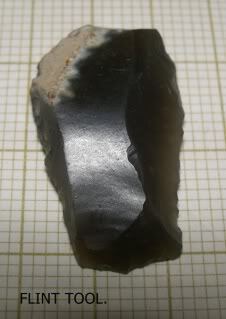 Is this a flint tool you found? 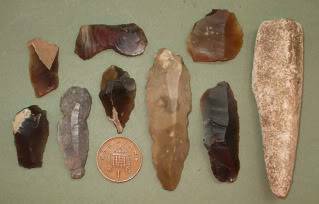 yes i have about 15 flint tools i have found nr to the rivers in the area where i live, this is what got me interested. That's pretty good, how do you ID them? Do you do it yourself of go to an expert? 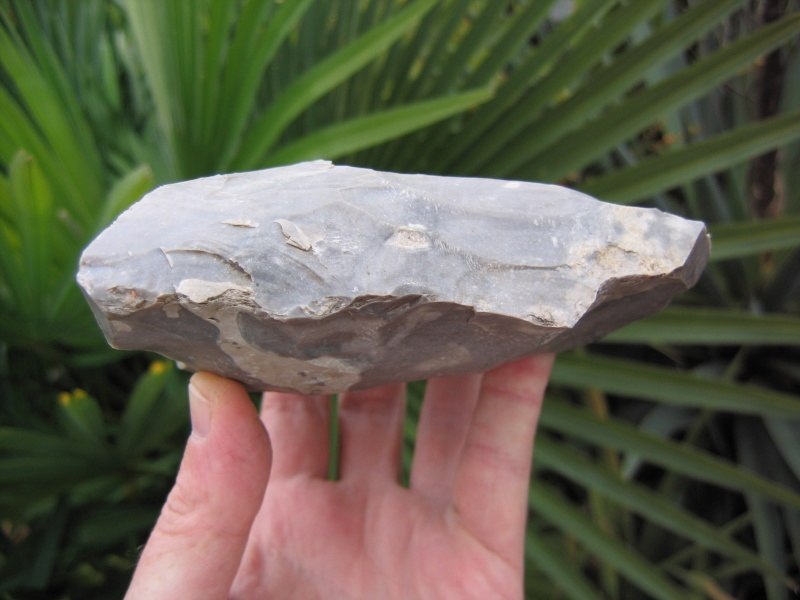 </A>i am a mod on the ukdn forum it has 4000 members and alot of experts, generally if you find flint around here its not natural and most have secondary working. the stone at the end has been worked but i have no idea what it was. 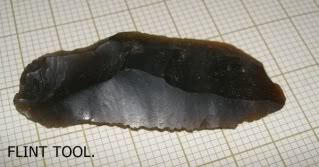 Hiya, the stone impliment at the end looks like a hone stone, for sharpening iron impliments. I suspect it is made of some natural stone with a fine grit. Not sure as to approximate date though, I'll make some inquiries and get back to you soon! 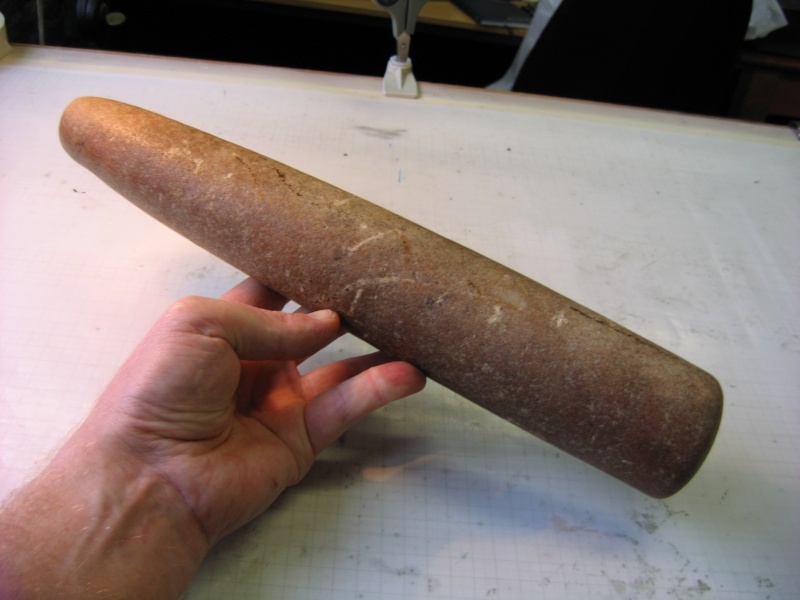 mr.hertzian cone wrote: Hiya, the stone impliment at the end looks like a hone stone, for sharpening iron impliments. I suspect it is made of some natural stone with a fine grit. Not sure as to approximate date though, I'll make some inquiries and get back to you soon! thank you, it does look like that now you mention it. it was from a field i have had roman coins off. 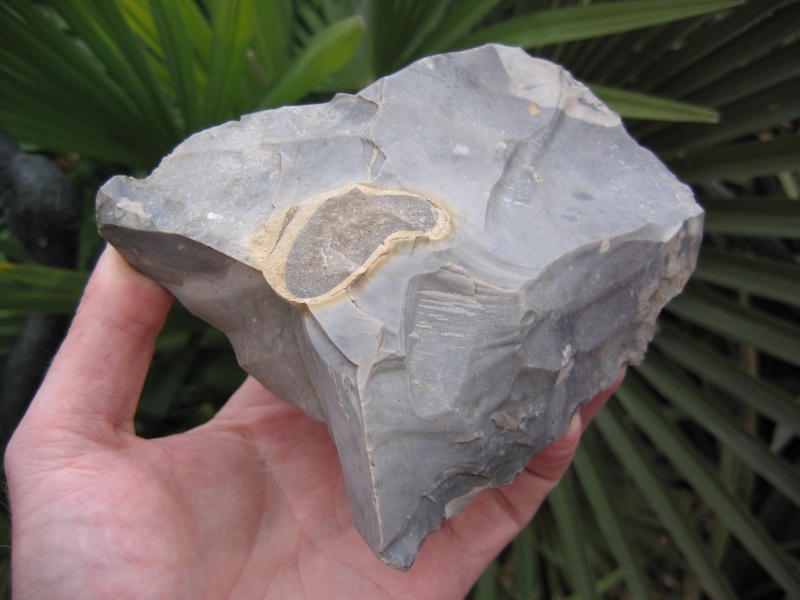 Now this huge broken lump is what I take for a failed Neolithic axe rough out. This (to my shame I have not yet recorded yet with the P.A.S) was found some time ago. There is a an "axe factory" near by. You can see why this failed in such an impressive way as there is a large lump of "grrr" in the middle (technical term, oh yeah!). Sadly no sign of the other half yet. 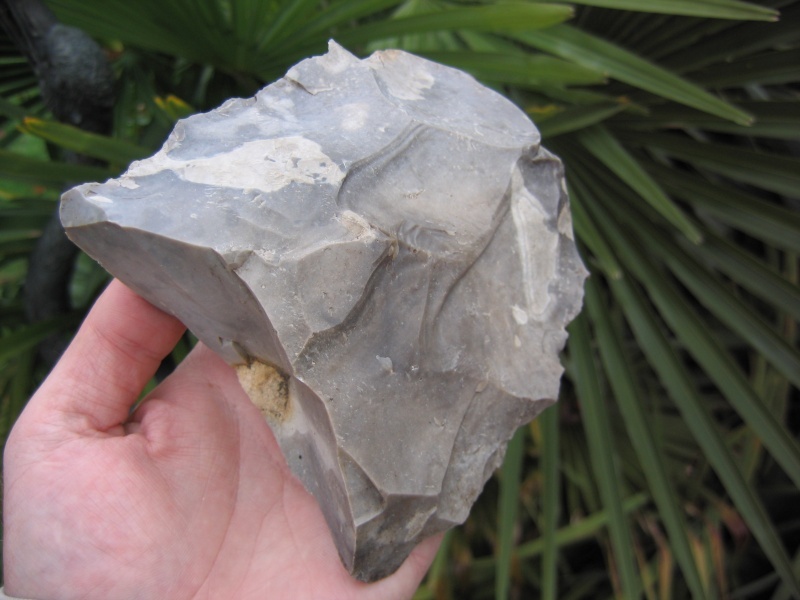 [img] [/img]And the side view, its still way off anything near finished and some of the edges are trimmed but not ground, some are sharp from the flakes removed, there is no cortex left so it would rank as a Whittaker stage 2/3 reduced biface. Must record this or the guilt will continue!! A good study piece though. That dark patch on the top in the second pic seems to be stepping, which suggest that inclusion goes all the way through. Nice to see this happened to folks back then not just us. Very true, in the first pic there are (on the top left of the pic) a load of flakes piling up right on that immovable lump, I'll have to take a photo of that side as it is hard to see from the angle of that photo. Whoever knapped that axe really tried to shift it in the hape that they could get through it, you can really see the intent of the knapper by "reading" the flakes. There is a flaw running from that lump which is why it failed. 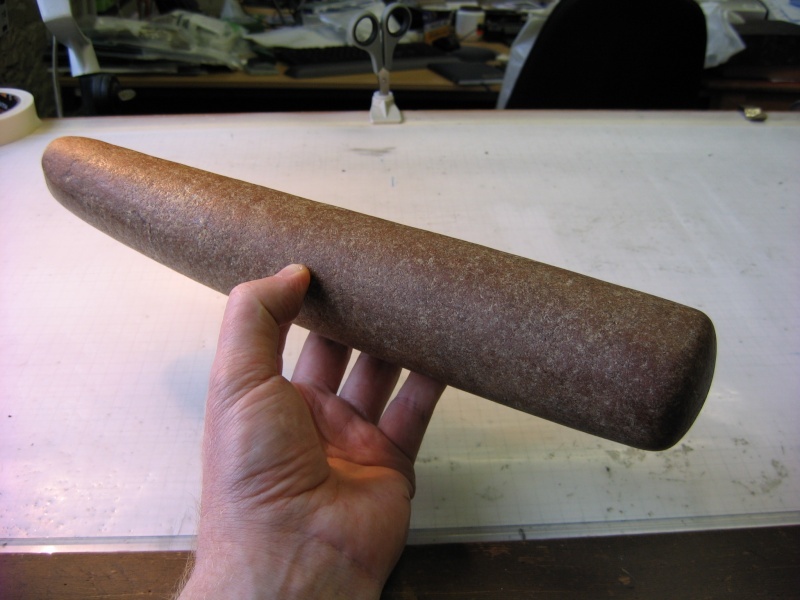 Ok, not flint but it is Neolithic, I think this is a pestle maul, it's made of quartzite and has been pecked and ground to shape. It has a slight banana to it! And it is slightly oval in section. I had not seen anything like this before now and there is little written on them, Evans lists them in "ancient stone artifacts of britain" in the late 1800's, and museums have some arty photos online of some examples, but no scale. Ug! 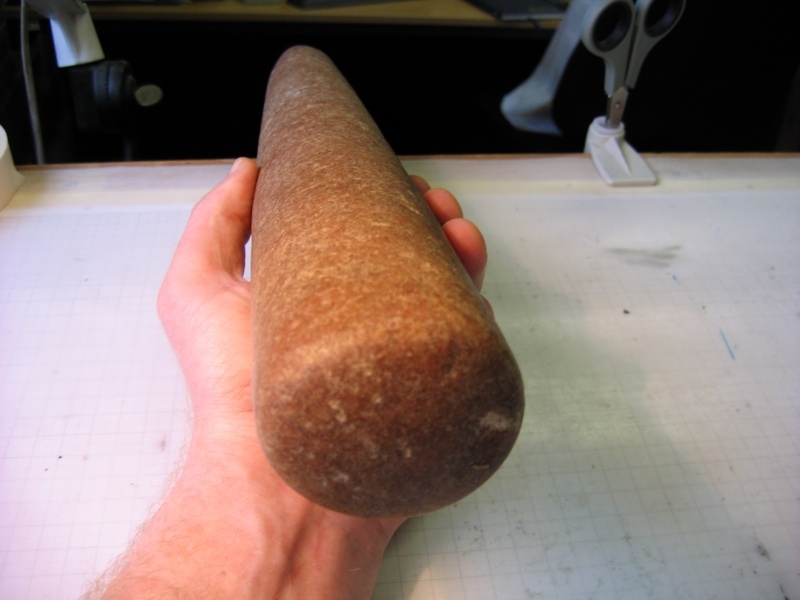 Looks like a pestle maul to me they had them everywhere in the shops where I was living a while back, all sizes.